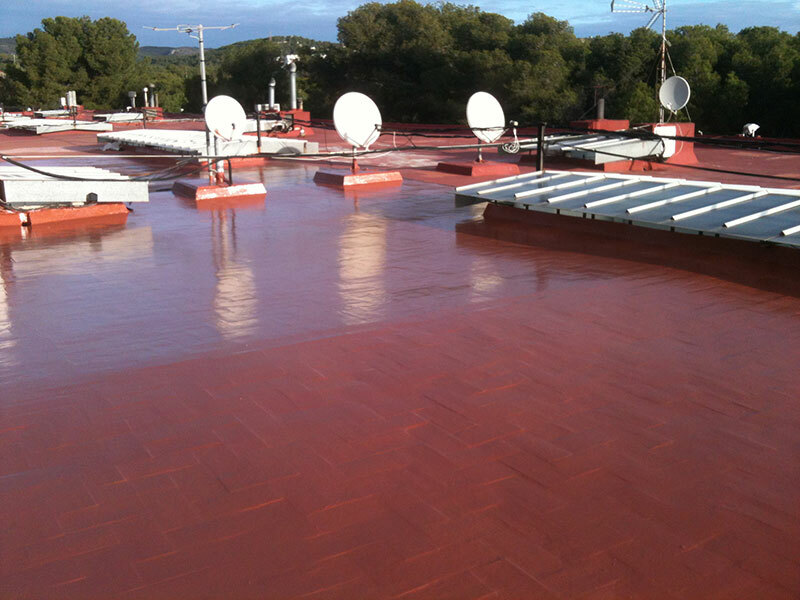 The renovation of older flat roofs requires effective and hard wearing solutions. TECNOPOL continuous systems provide excellent results without the need to remove the existing paving or flooring surface. In addition, the nature of these finishes makes them ideal for use on older roofs which are hardly ever perfectly smooth or flat. Where the renovation also requires thermal insulation we can provide one of the best systems on the market providing optimum results in terms of low heat conductivity. Initially the floor will need to be cleaned down to remove all traces of the previous waterproofing material or loose pieces, and cracks and joins should be filled or repaired to ensure as flat a surface as possible. A transversely deformable adhesive band, formed of a viscous-elastic layer coated on a nonwoven mesh. The nonwoven element allows adaptation to the support of the band and is highly recommended for specific applications of DESMOPOL liquid polyurethane and polyurea membrane. MASTIC PU is a single component polyurethane mastic that cures rapidly on contact with atmospheric moisture, forming a hard sealant, elastic and of a medium-high elasticity modulus. For sealing of vertical and horizontal joints. First apply a coat of primer resin to ensure maximum adhesion to the surface. PRIMER PUc-1050, is a two component, low viscosity, 100% solids polyurethane resin. 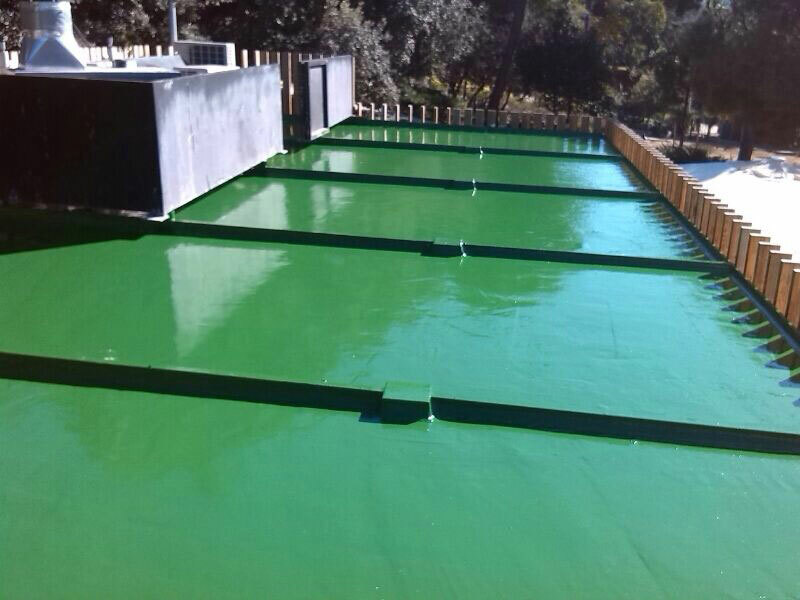 It is specially designed to increase the adhesion of waterproofing systems, improve the rough floor in structural surfaces such as concrete or mortar, in waterproofing systems applications as TECNOCOAT pure polyurea or polyurethane DESMOPOL, and always in low ambient temperature conditions. 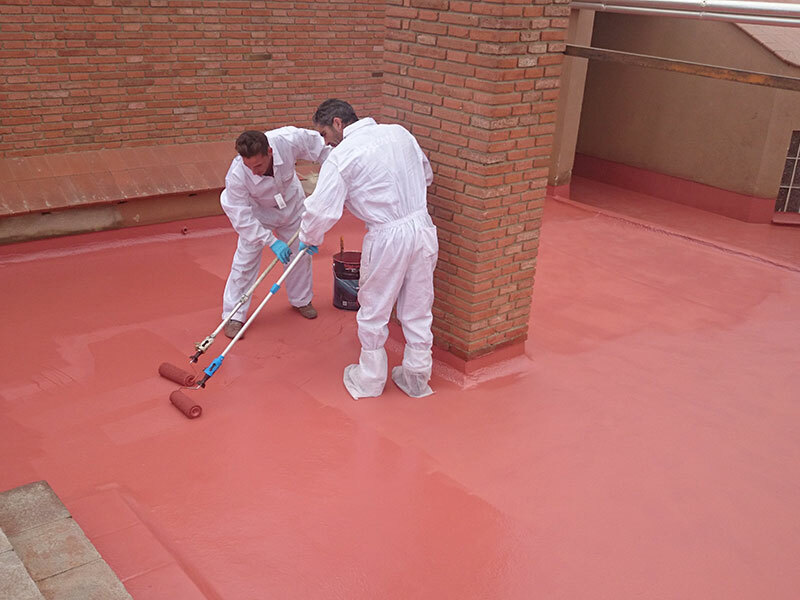 PRIMER EPw-1070, is an epoxy water-based resin, without solvents, specially designed to increase adherence of our liquid waterproofing systems DESMOPOL and TECNOCOAT P-2049; also for the flooring systems TECNOFLOOR. PRIMER EPw-1070 has 0% volatile chemicals. Depending on the system chosen a membrane from either the DESMOPOL or TECNOCOAT range will be used. In the event of applying the DESMOPOL system on ceramic or brick surfaces it is recommended that the DESMOPLUS 1 LAYER additive is employed to make the membrane more resistant. DESMOPOL is a single component liquid made up from pure polyurethane, which once catalyzed forms a continuous elastic membrane, without any joints, overlapping or any integrated mesh needs. Its properties make it an excellent choice for achieving air-tightness and perfect waterproofing on a multitude of surfaces and substrates. It is applied manually, using a roller or brush and, exceptionally, using specific spray equipment. It has CE marking on the basis of a statement made DoP Declaration of Performance (DoP) conforms to the regulations UE305/2011. This declaration is available on demand. DESMOPOL, has a European technical approval ETA 10/0121 and BBA 16/5340 (W3: working life 25 years, 1,2mm minimum thickness). 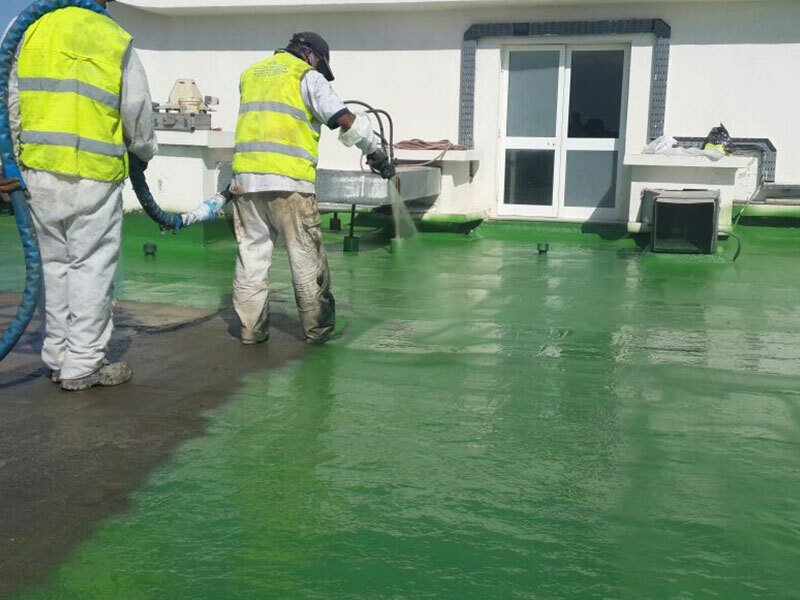 The 100% pure polyurea TECNOCOAT P-2049 system was developed as a two-component, sprayable, aromatic coating suitable for waterproofing, protection and sealing in general. It's made up of two high reactive liquid components, isocyanates and amines, which are mixed together using specific spray equipment, to form an aromatic, continuous, seamless, high density, solid and elastic pure polyurea membrane, with high mechanical and chemical resistance qualities. It has CE marking on the basis of a statement made DoP Declaration of Performance (DoP) conforms to the UE 305/2011 regulation. The declaration is available on demand. 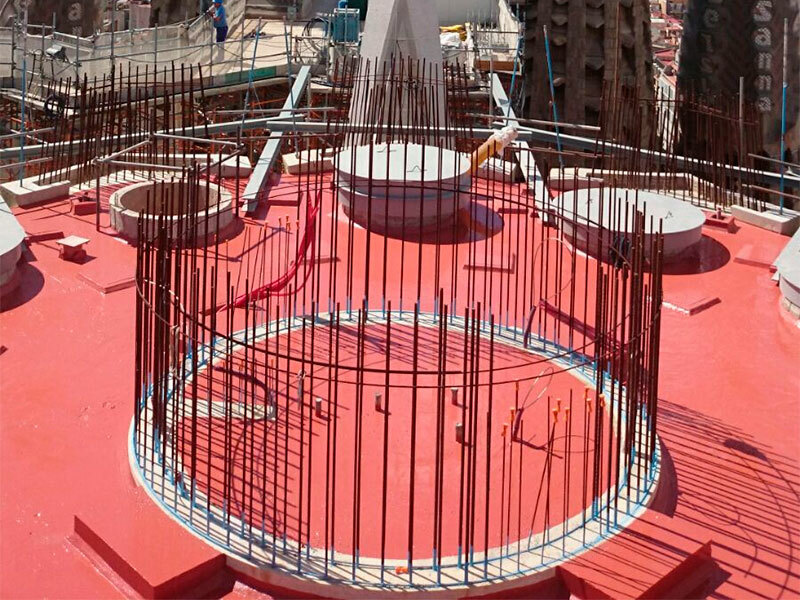 The 100% pure and elastic polyurea TECNOCOAT P-2049 EL system was developed as a single coating suitable for waterproofing, protection, and sealing, especially in elements with structural movements. 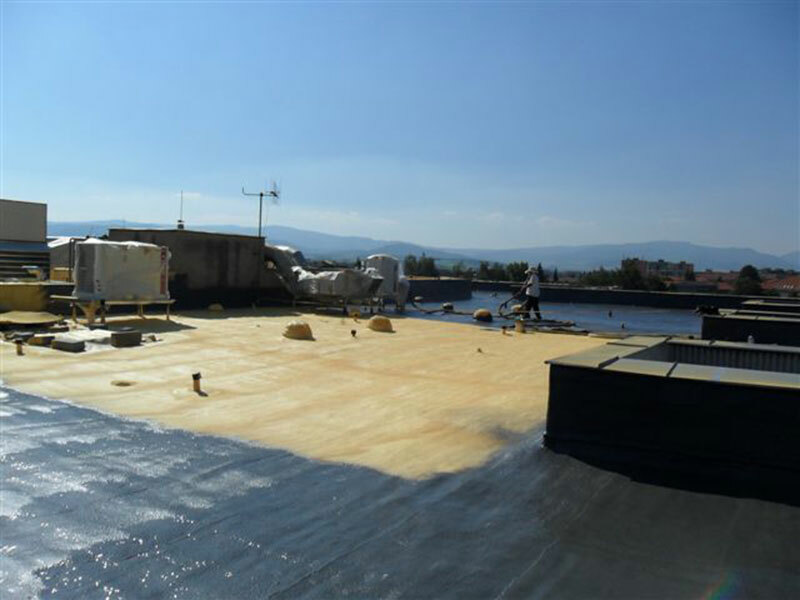 The pure polyurea TECNOCOAT P-2049 EL membrane is made up of two high reactive liquid components, isocyanates, and amines, which are mixed together using spray equipment. TECNOCAOT P-204 EL is an aromatic high density and elastic pure polyurea and excellent elasticity. DESMOPLUS is an additive which gives to the single component polyurethane membrane DESMOPOL several properties to facilitate its application in one layer without bubbles inside, improve their physical and mechanical properties, and gives a fast dry time. It is suitable for the application of DESMOPOL polyurethane membrane in low temperature conditions or adverse weather conditions. DESMOSOLVENT is a diluent for DESMOPOL polyurethane membrane and TECNOTOP aliphatic resin topcoat. The dilution is only recommended by spray application ("airless equipment"). Also could be used for tools and equipment cleaning. 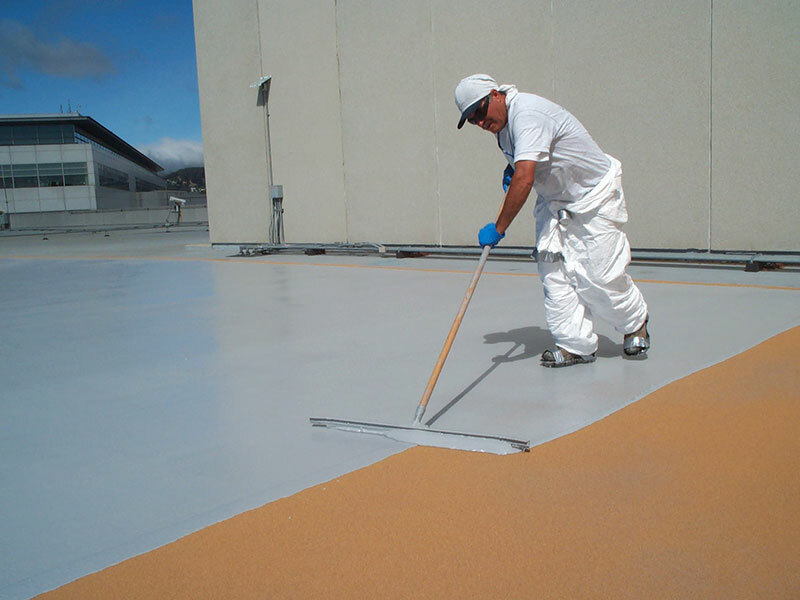 The TECNOPOL finishing coat consists of an aliphatic resin, highly resistant to UV rays and hard wearing (can be walked on), and to which an anti-slip finish may also be added (conforms to CTE DB SUA, Class 3 classification (Rd >45), according to UNE-ENV 12633:2003). TECNOTOP can also be supplied in practically any colour. 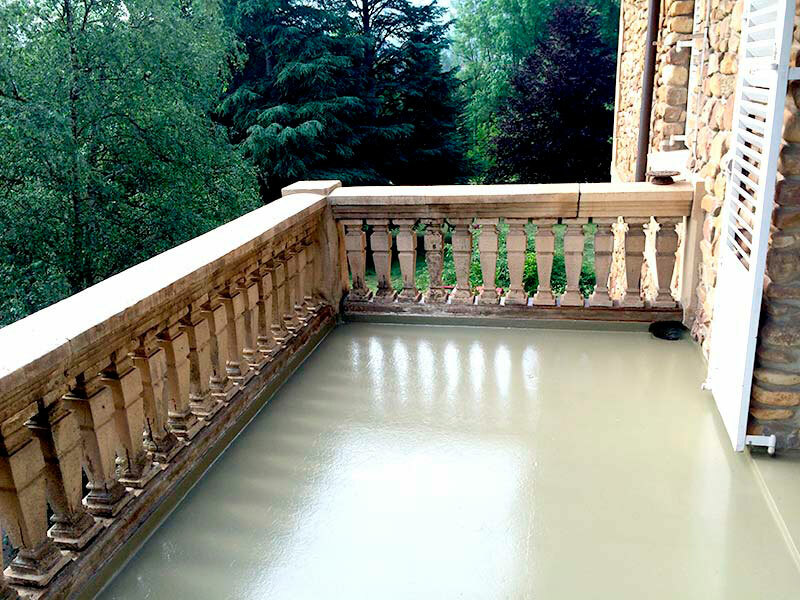 TECNOTOP 2C is a two-component aliphatic polyurethane resin for treatment, decoration, and protection of flooring has a shiny finishing and forms a hard, strong, continuous film, with excellent adhesion and mechanical properties as its excellent resistance to abrasion and stress that make it resistant to weathering, extreme temperatures, and UV radiation. Is suitable for coating protection for traffic deck. Initially the floor will need to be cleaned down to remove all traces of the previous waterproofing material or loose pieces, and cracks and joins should be filled or repaired to ensure as flat a surface as possible. It is also important to provide a clean and aesthetic appearance as the coats we will then apply are completely transparent. .
An adhesion promoter will then be applied to ensure proper adherence to the surface. One component, impregnation alcoholic solution containing adhesion promoters. Is an alcohol-based impregnation, colorless, without yellowing. Specially designed to increase adhesion on non-porous substrates, for uses under DESMOPOL T, transparent and aliphatic polyurethane membrane. A coat of aliphatic transparent gloss membrane will then be applied.